Cranberries can be grown in your home garden easily with some arrangement and care. 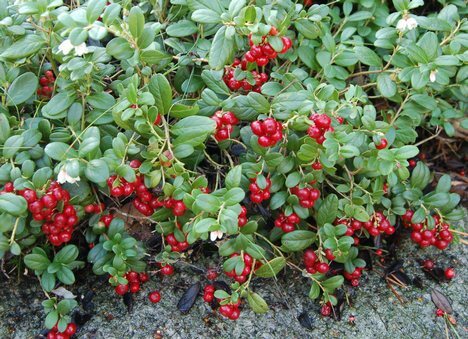 Cranberries grows well outdoors in zone 2 to 5 and other zones they can be grown well in containers in indoor gardening. Prepare bed garden for Cranberry, digging 6 to 8 inches depth for about 4 by 8 feet area. Cranberries are very specific about the soil they grow. So remove all the existing soil and fill the bed with peat moss, 1 pound of blood mean, ½ pound of bone meal. Mix well the above material. Once you prepare the bed, water the bed thoroughly to make it wet but not soggy. Ensure that you water the bed properly. Peat moss take lot of time to soak completely for the first time so make sure you do not over water. Allow the area to completely soak for 24 hours before you plant. Buy rooted cuttings of Cranberries from your local nursery. Make sure you buy one year or three year old cranberry rooted cuttings. Purchase at least 5 to 7 cuttings. Plant the root ball cuttings 2 inches below the ground level in the bed garden and 1 foot apart each if the cuttings are one year old. 3 foot apart each for 3 year old cutting. Cranberries are runners so they need plenty for room between plants. As they start growing, they will fill your bed garden. Best time to plant cranberries are from October to early November. They can also be planted in springtime in the middle of April to the end of May. For early berries grow 3 year old seedlings. Cranberry takes 3 years to start bearing fruit. If you plant 3 year cuttings, you might get some berries during the first fall. One year cutting make take longer to get harvest. Water the plants regularly do not allow the area to dry. Cranberry roots will not survive if they are not wet. Feed your plant for the first two years with nitrogen. After that feed them with fish emulsion fertilizer (2-4-2) at a rate of 1/2 gallon once at the growing stage and at the blooming stage. Too much fertilizer will reduce the number of uprights which will lead to no berries. Do not prune your cranberries for first 3 years of planting. Trim your plant after three years by trimming the runners and cut the old shoots. Repeat the pruning process every 3 years or whenever it is necessary. Clean up the cranberry bed and give the plants more room to grow well. This will help the plant to grow healthy and produce heavier yields. Mulch your plants heavily at winter with pine needles as they are the excellent to protect your plant. Harvest your tasty cranberries before the first frost in your area. Ripe berries will be deep red with brown seed inside.